BBC NEWS | UK | UK Politics | How bad is loans row for Blair? How bad is loans row for Blair? The facts are simple and undisputed. Four individuals, at least, made loans worth millions to the Labour Party before the last election. Shortly after, those same four men were recommended by Tony Blair for peerages. Many of the most senior people in the Labour Party - including, amongst others, the treasurer, the deputy prime minister, the chancellor of the exchequer and the lord chancellor - knew nothing about the loans. And, under rules created by Labour, the loans did not need to be declared, as donations would have been. 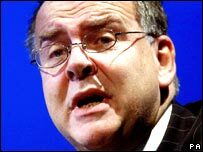 Lord Chancellor Lord Falconer has admitted if it had not been for the revelations there would not now be moves to change the rules. So the questions are as simple as the facts. Did Labour offer peerages for secret loans - an allegation fiercely denied by ministers? Who actually did know about it, apart from Tony Blair and a small group of confidantes? And why were the senior party figures kept in the dark about it? The danger for Tony Blair, however, is that it may not matter what the answers to these questions are. The danger is that the "sleaze" tag gets attached to his government, and him in particular. And now, even some of the prime minister's supporters, notably the Guardian newspaper, are suggesting he should bring forward his departure, to give the party a fresh start. Since the original revelations hit Westminster there has been a huge flurry of activity by all three parties, with promises to change the law and reveal all sources of funding. The Tories have admitted they have previously benefited from donations and confirmed that some of those donors are now sitting in the Lords. And leader David Cameron, echoing Tony Blair's old "whiter than white" claims in 1997, is promising to "clean up" politics. Liberal Democrat leader Sir Menzies Campbell has insisted his party had not nominated anyone for a peerage who had loaned it large sums, but acknowledged his party received loans from three people in the period before the election and have declared their names and the sums lent. And now the government is going to outlaw secret loans and look at alternatives such as state funding of parties. But to a very large extent, all that is either irrelevant or, at least a diversion. Cynics have gone so far as to suggest it is all a smokescreen to keep attention away from the central issue. 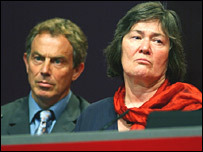 Former cabinet minister and Blair critic Clare Short, amongst others, has described that issue in characteristically blunt terms. "What we're getting is a bubble of these clever people who've captured the state, don't need a party, don't need any members, don't have turbulent people having opinions, who then get money from rich people and run our state without consulting anyone else," said Ms Short. The prime minister has put his hands up and admitted senior party figures should have been kept informed and that the rules are not tight enough. At the same time, however, he has pointed out this government has introduced greater transparency to party funding than any previous government and that, in effect, they've all been at it. So there is a cross-party agreement that things have to change and there will now be a wide-ranging debate about it. 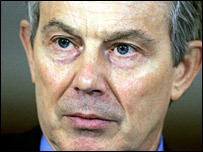 But will that do anything to restore the public's confidence in Tony Blair which, polls suggest, it at an all time low? If it fails then this latest row will only add to the growing pressure on the prime minister to step down sooner rather than later.